How can we enhance patient engagement? Of course, the role of care personnel cannot be underestimated: they need to educate patients about care protocols, the steps included there and how staying on track could positively contribute to the recovery. In theory, this sounds simple, but no standard models for patient education exist. Hey all and welcome back to our blog! 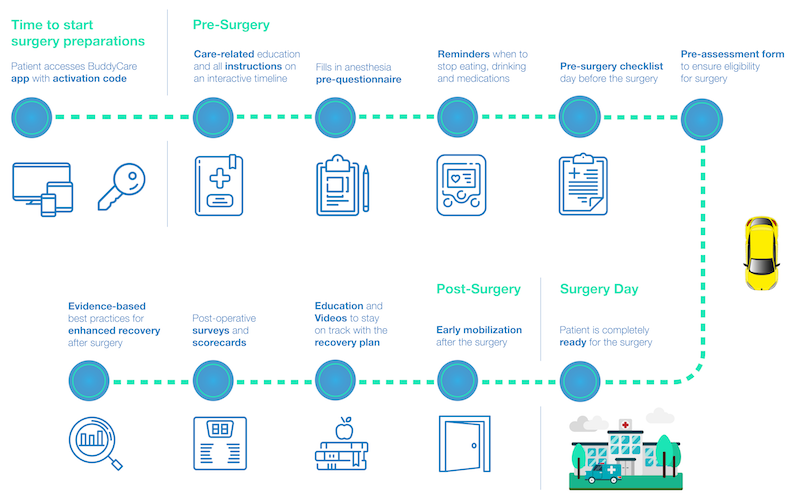 In the previous post, we started covering ERAS and how it contributes to what Buddy Healthcare does in improving surgery patients' experience. Let's continue! So ERAS (Enhanced Recovery After Surgery) is a care pathway for a specific procedure that includes a set of pre-determined activities, rules and guidance. As we already mentioned, evidence-based ERAS pathways could yield significant opportunities for Buddy Healthcare. The core of successful implementation of ERAS is the patient and his/her own commitment to the care process. The more committed the patient is, the better results these pathways bring. So how can we enhance patient engagement? Of course, the role of care personnel cannot be underestimated: they need to educate patients about care protocols, the steps included there and how staying on track could positively contribute to the recovery. In theory, this sounds simple, but no standard models for patient education exist. Without comprehensive patient education, the effect of ERAS pathways won't reach its full potential. So first, we need standardized patient education tools and methods. Let’s assume we have a tool (the BuddyCare app, for example :). The question then is, how to make patients motivated and engaged? The answer is, by providing them with something simple and easy-to-use that makes their lives easier (and that's what we're working on here!). Patients want to be active participants in their own care and not merely by-standers told what to do and when. They want to be part of the decision-making process and utilize mobile solutions in their care. The next question is, how to motivate caregivers to take ERAS pathways into use? In our opinion, there is no complete patient experience without care personnel experience. It means, that if care personnel don’t see the value in the standardized pathways, the reciprocal relationship between the hospital and the patient doesn’t reach its full potential. This is why the solution must be positioned in a way that it not only eases patients’ lives, but makes physicians’ and nurses’ jobs easier as well. The BuddyCare solution considers both caregiver's and patient's experience by making sure that patients are in the right place, on the right time, prepared for the procedure. For patients, BuddyCare simplifies communication with the doctors, automatizes surgery preparations and instructions. Thus, through BuddyCare, caregivers can educate, engage, guide and activate patients to achieve maximum value of ERAS. Please share your thoughts on educating and engaging patients and caregivers! In the next post, we’ll tell you more what the near future brings for our work and surgical care. Cheers and stay tuned!